We find that a lot of successful small firms still dream of opening more physical branches as opposed to only expanding online. This is not mutually exclusive to outsourced accounting services; in fact your overseas team can be an extremely helpful tool in helping your additional brick-and-mortar locations open their doors. Expansion fears – nobody but you truly gets your business. The fear a lot of ambitious small-firm owners face is that they’re not going to be able to find the right people who “get it”. They’ve built up their business via branding and quality that is tied into the personality of the accountant – it seems like a near impossible task to find an in-house hire that can bring the exact same mix of ingredients to a new location. This is a valid fear – the wrong hire can not only not support your carefully crafted culture, they can actually hurt it by smearing it with their own personal foibles. Also, you’re looking for someone who can not only handle the accounting tasks, but is also able to take on the leadership role as the head of the new location. Outsourced accounting services bolster new branches. Reliability is perhaps the biggest factor people are going to look for in your new branch. They’re going to want the same level of quality and personal services that made a name for your original location. You’re going to have to shift your firm’s working model from being entirely reliant on you, the owner. This means taking your clients’ perception that it’s you personally that offers them great service to the understanding that it’s your overall firm that is the source of the quality they’ve come to expect. At the most basic level this means that you have to delegate. You cannot be the one doing all of the number-crunching for compliance, bookkeeping, and so on. You have to develop a system (more specifically, a workflow) that your employees can follow so that quality and speed is maintained across all of your hires. Outsourced accounting services are tailor-made for just that purpose. Instead of hiring multiple in-house hires and trying to hammer them into shape you have a single person in each of your branches funnel the necessary information to your overseas team. Since all of your files are going to the same location and the same people overseas the work will have a built-in consistency. You are able to tweak how your virtual accountants work so that they work in your style and workflow. This means that files will always come back with your brand of quality control no matter which branch was its originating source. Your marketing is going to have to shift as you build more branches. If it focuses solely on your own personal awesome skillset nobody is going to work with your other in-house staff at your other locations. You’re going to need to change the way your clients view your firm. It’s no longer “Bob or Jane the awesome accountant,” it’s now “Firm X”. More specifically, tailor your branding so that it revolves around what your firm as a whole can do for your clients. Using ourselves as an example, our “Bob or Jane” statement would be “Peter Vickers has a thorough knowledge of how to use outsourcing to boost your business.” However it’s not likely that when you partner with us that Peter will be handling your day-to-day affairs. His daily schedule is all about improving BOSS as a whole. The “Bob or Jane” approach to marketing would lead you to disappointment since you likely won’t be getting Peter’s personal touch on a day-to-day business, whereas the “Firm X” approach shows you how all of us here at BOSS are working to help you build the best possible version of your business. When is it a good time to expand? Workflows that ensure you have quality control in place. Outsourced accounting services that will guarantee your work comes back with consistency no matter which branch the files originate at. You’re able to shift your branding focus from your own personal touch to a firm-wide message. 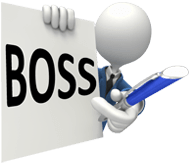 BOSS (Back Office Shared Services Pty Ltd) is New Zealand’s premium outsourced accounting services provider supplying well-trained high-quality accountants and bookkeepers. To discuss your needs and how we can help, Book a Consultation NOW!